Yarmouth Seniors – Do You Need A Ride? to shop for groceries, get your hair done, etc. The details of pickup and drop off will be worked out after you contact us. If you would like to take advantage of this new service, please contact Jean Rafford by phone at (207) 329-7295. Leave your name, telephone number, and the day you might like a ride. Please help spread the word to others who may needs rides. We hope many of you will join this important new effort in our community! Posted on October 9, 2012 October 9, 2016 Author ycan11Categories YCANTags Senior ServicesLeave a comment on Yarmouth Seniors – Do You Need A Ride? Senior Rides Program: Volunteers Needed! This service will be offered on Tuesday and Thursday mornings from 9 am to Noon, starting in September, 2012. Between now and then, we will be recruiting volunteer drivers and spreading the word to seniors who have expressed an interest in this service. One or two volunteers to help us coordinate the scheduling of drivers and clients. Volunteer drivers who could drive at a scheduled time once or twice per month. For more information about YCAN, please explore this site further! Posted on May 15, 2012 October 9, 2016 Author ycan11Categories YCANTags Senior Services, Volunteers NeededLeave a comment on Senior Rides Program: Volunteers Needed! Could you help YCAN sell raffle tickets at the Yarmouth Wellness Fair on Saturday, April 14 between 9 AM and 3 PM? All proceeds will benefit YCAN programs, including the Fuel Assistance Fund, the Yarmouth Community Food Pantry, and Seniors Are Treasures. We are seeking people willing to staff our table for one hour (or more if you wish) that day. If you are interested, please contact us via e-mail (ycan@ycan.info), or by phone at (207) 838-2261. Thank you, and be well! Thank you Yarmouth for helping the Fuel Assistance Fund exceed its 2011 goal! 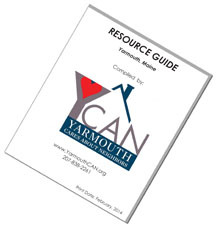 The 2011 Yarmouth Cares About Neighbors (YCAN) Fuel Assistance Fund Drive has raised over $35,000, and spent over $20,000 to date providing Fuel Assistance to 61 qualifying Yarmouth households. Winter is not over yet (despite the occasional beginnings of mud season), so we expect total expenditures to continue growing between now and when warm weather becomes more predictable. Last year at this time we had assisted 32 households – so this year’s need to date has been 90% greater than last year’s despite our relatively mild winter. Our community has made it possible to meet this increased need. The Yarmouth Community Food Pantry, Fuel Assistance Fund, and Seniors Are Treasures programs can always put your time, goods, or funds to good use! Click on any of the highlighted program names above for more information. Posted on February 21, 2012 October 23, 2012 Author ycan11Categories YCANTags Fuel Fund1 Comment on Thank you Yarmouth for helping the Fuel Assistance Fund exceed its 2011 goal! Thank You for a successful “Project Holiday”! All of the above groups worked together to ensure that each family had food on the table, something to keep them warm, and something to help the children believe in Santa Claus. YCAN was formed to bring the community together to help residents who need assistance. Project Holiday is a shining example of what can happen when we all band together for a common cause. Our community can and does make a difference! Posted on January 9, 2012 October 23, 2012 Author ycan11Categories YCANTags Project HolidayLeave a comment on Thank You for a successful “Project Holiday”! Students at the Harrison Middle School recently completed a celebration of Geography Awareness Week. This year’s theme was Geography: An Adventure in Our Community. Students were involved in many activities throughout the week to help them improve their geographic literacy. In addition, they focus on a service learning project each year to demonstrate good citizenship. The beneficiary of this year’s service project was the Yarmouth Community Food Pantry. The student body collected coins (nickels, dimes, and quarters) for five days to donate to the pantry. A check for $730 was presented to Pantry Manager Sue Rowe to help people in need in Yarmouth. Geography Awareness Week is an annual event sponsored by National Geographic throughout the country.